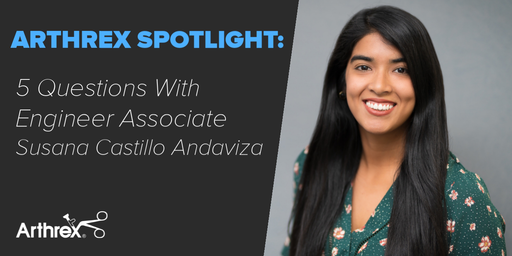 Five years, four positions and countless memories make up Engineer Associate Susana Castillo Andaviza’s Arthrex experience. In this edition of our 5 Questions series, Susana tells us about her role in the Sutures department, the advice that motivated her to develop her career and the highlights from her time here so far. First thing in the morning, I check my emails and my to-do list to prioritize what’s most important that day. Then, our team gets together with the Quality and Planning teams to talk about any manufacturing requests and/or major projects. There are about 18 people in our morning meetings. On the Sutures team, we work a lot with the TightRope® fixation system, FiberTak® kits and Meniscal Cinch sets. I’ve only been on the team for about eight months and I get to learn new things almost every day. I worked in the clean room as a suture operator for three years and it’s different to be on this side of the process. Because I was involved directly in working with the sutures in the clean room, I have a good understanding of how it works. Now I get to update our work instructions, so having that background definitely helps! I’ve been able to see rapid growth here. Not only the expansion of the global headquarters, but my professional growth as well. In the past five years, I’ve been able to work in different departments and positions. In 2013, I started working in Packaging on the night shift. I advanced a few times from there; I was a suture assembly operator, then I worked in Boxing for sutures and now I’m using my Bachelor’s degree in biomedical sciences, which I finished in December of 2017, to be an engineer. Take every opportunity. One of my opportunities was to further my career through more education. I never gave up on it and worked from 7 a.m. - 3:30 p.m. and then attended classes from 6 p.m. - 10 p.m. Now I’m able to use what I studied in school here at work in my new position. I like to spend time with my family and my fiancé. We got engaged 10 months ago, so we’ve been doing a lot of wedding planning! He’s also celebrating his five years of service with Arthrex this year and we’re using our Trip of a Lifetime for our honeymoon. We also love making and finding Peruvian food. I was born in Peru and I can’t get enough of all the delicious food from there. My fiancé is Venezuelan and it took some time for him to get used to all the spices, but he loves Peruvian food now too!